We manufacture a complete line of floor mouldings as well as baseboards, casings, quarter-round and other popular mouldings. All of our mouldings are solid wood with no finger-jointing. 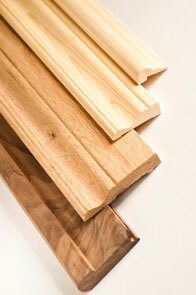 We offer a full range of standard profiles in almost any wood species. These include floor trims such as Bullnose, T-Mould, Carpet Reducer as well as casings and baseboards, ranging in lengths from three feet to 14 feet. Bring us your plans and we will fill your order to maximize your yield and minimize waste. We use only high quality, kiln-dried raw materials to minimize shrinkage, and our profiles are cut using modern equipment to eliminate chatter, meaning minimal sanding and your materials are ready for their final finish coat.